This cottage is on 2 levels. The ground floor accommodates the kitchen, dining & living area, a double bedroom, a single bedroom & a bathroom. The upper floor has a double bedroom with ensuite shower room & a further twin room. The living room & 3 of the bedroom overlook the cobbled courtyard. The 4th bedroom overlooks the patio area and the Ochil Hills. The cottage is fully double glazed and has central heating. All our 5 cottages are set in a tranquil village location but only a 5 minute walk to shops, pubs, coffee shops, takeaways, restaurants, banks. post office, hairdressers & newsagents. We are located 5 miles from Stirling & minutes away from all Scotland's major motorways. We are 1 hour away by car from Dundee, Perth, Edinburgh, Glasgow, Loch Lomond, Gleneagles & St. Andrews. All the cottages are family friendly & all but one of the cottages are pet friendly. We are set in large beautiful landscaped gardens complete with pond & their resident ducks. Sometimes the swans pay a visit. We are located at the foot of the local Ochil Hills where you can go walking, hill walking & paragliding. The area has 9 golf courses for you keen golfers. There are plenty of fishing sites, one available in Alva itself. The Devon River is a 5 minute stroll away. There are dedicated cycle & walking paths in the area & a dry ski slope 2 miles away. If you enjoy horse riding then there are riding schools close by. Other places of interest include Alloa Tower, Sauchie Tower, Wallace Monument, Stirling Castle, Castle Campbell, Dollar Museum, The Falkirk Wheel, Callendar House, The Safari Park, The Peak leisure centre for swimming & ice skating, Kidzworld , The Trossachs national Park to name but a few. I grew up in Northern Ireland with my 2 siblings. I finished my schooling and then went and completed my degree in Human Nutrition and Dietetics. While on holiday in Corfu I met Colin from Alloa in Scotland who is now my husband. Colin is an architect and has had his own practice now for 24 years. We went on to have our lovely girls and lived in Alloa for a while. We bought Boll Farm in Alva then a derelict site in early 2000, where we created our home and our 5 holiday Cottages. I love being here and enjoy meeting all my guests from all parts of the globe. As I said before Colin and I lived in Alloa for the first few years of our marriage. As Colin was an architect he was always looking for an old building to recreate and put his own stamp on. We passed by Boll Farm many a time and wished that we could buy it. It eventually cam on the market and we jumped at the chance to purchase it. Boll Cottage is the original old farm house and a very lovely cottage. When we saw the farm originally we fell in love with the views and its potential. We knew the site would make a lovely home and also create a business for me to run, hence once our house was built and we had refurbished Boll Cottage we then went on to build a further 4 cottages. Bathroom 1 is on the ground floor & consists of a double shower enclosure. Bathroom 2 is an ensuite to the double bedroom upstairs. Towels & tea towels provided, but not beach towels. Teabag, sugar & coffee sachets. One pint of milk is provided. 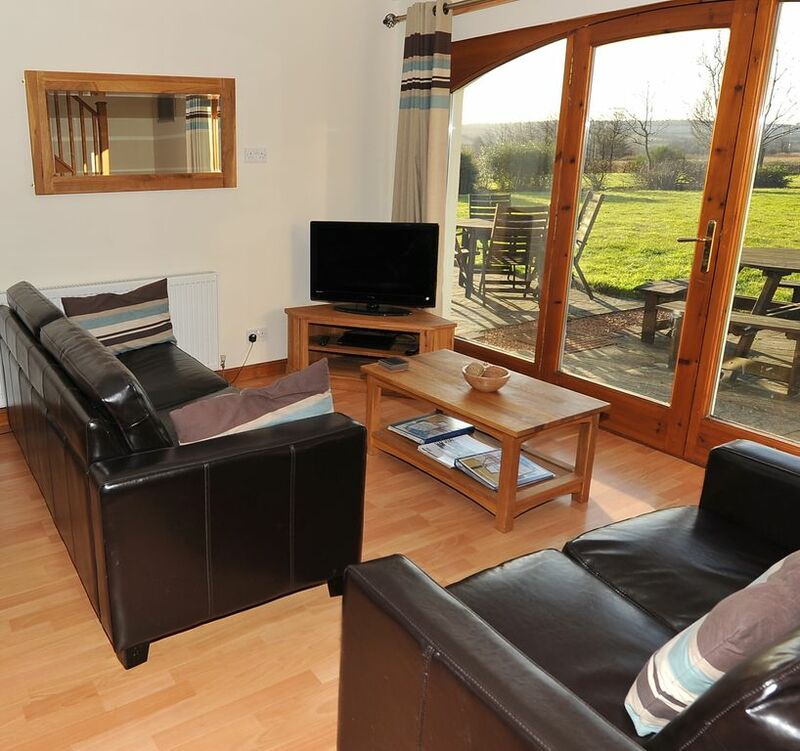 Clean, spacious,well equipped cottage in a lovely area. Owner couldn’t be more helpful. Thank you so much for taking the time to write such a positive review. I hope we will be able to welcome you again in the not too distant future. The location could not have been any better. An easy walk into town for pubs, shops, great foods and drinks. The people were amazing and welcoming. Maria was welcoming and if we had any questions or concerns she was happy to help. Our family loved our stay here in Alva. The cottage was clean and set up perfectly for family with 4 bedrooms and 2 bathrooms. Town was quiet with good food at the local pub. Central location to Stirling and Edinburgh that were easy to get to by car. Host was very helpful and cheerful. Would stay again. The cottage was well equipped, comfortable & central for exploring Stirling, St Andrews, Falkirk and all the wee places in between. Maria was very welcoming & keeps these properties to a very high standard. We had a super time thanks. Die wirklich für 6 Personen ausreichend große , sehr gemütliche Wohnung biete eine wunderschöne Aussicht und liegt sehr günstig zu vielen Zielen in Schottland und Nordengland. Schöne Wohnung, supernette und jederzeit hilfsbereite Vermieterin. Gute Lage zu vielen Ausflugszielen. We are located in the village of Alva, 5 miles from Stirling. We are situated at the foot of the Ochil Hills for walking, hill climbing and para gliding.There is also a dry ski ski slope 2 miles away. There are 9 golf courses in Alva. The closest is Alva Golf Club. In addition there is Tillicoultry golf club, Schawpark golf couse, Brae head golf club, Tulliallan golf club, Sunnylaw, Falkirk Tryst, Bruce fields, family golf & Airthrey golf course. There is horse riding available at Nowton Fishcross, Devon Equestrian Centre.Alloa.both 2 miles away. Fishing is readily available in theses areas: Frandy Fishery, Gartmorn dam, Castle hill Reservoir, GlensherrupTrout Fishery, Harviestoun Fishery Alva, The River Devon. these are all located 1-4 miles away. Other places to visit are Castle Campbell, Stirling Castle, Sauchie Tower, Alloa Tower, Dollar Museum, Wallace Monument, Church of the Holy Rude, Cambuskenneth Abbey, Stirling Smith Museum, The Falkirk Wheel, Callendar House, Bannockburn Center, Bair Drummond Safari Park, Kidzworld, Loch Lomond National Park. There are plenty of restaurants in the vicinity, Bollinis of Alva, The No. 5 Inn, The Woodsman, Alva Tandoori, Aldos The Birds & Bees, The Meadow Park, Corrieries, Jam Jar, Barga, The Torbrex Inn. These have all been recommended by ourselves, friends and family. The rates quoted are for 7 sharing. Please contact me if you require quotes for smaller numbers of guests.